This is a story about a tiny family of two. The mother is devoted to her little boy, considers his care her number one priority. The child, too, adores his mum. And yet the mother presents at parenting courses tearing her hair out at her son’s ‘defiant’, ‘uncooperative’, ‘aggressive’ and ‘destructive’ behavior. She is bewildered that her son, as she sees it, deliberately breaks the rules in order to make her angry – and he does it so well. She feels that both her own anger and her child’s behaviour are out of control. She reads articles and attends courses about anger and stress management and parenting and it all sounds good in theory. The trouble is, the strategies seem almost redundant when things are going well – yet nothing seems to make any difference in those moments when things blow up, conflict spirals, and it all ends yet again in shouts, tears and desperation. If he’s so naughty now, he will grow up to be bad, get in trouble at school, spoil his education, hang out in the wrong crowd, do drugs and waste his life. and: If I can’t handle him at this age, how will I manage in a few years time? What have I done wrong? I’m a failure as a parent. What ever made me think I could do this job? Obviously I have stuffed something up badly. The more she pushes, the more the boy resists. The mother grows angry. She slams a door or bangs things about. Finally, often after a long standoff, screaming and crying on both sides, the mother breaks down. She either explodes in abrasive anger, or breaks down and sobs. At that point, they both surrender. Emotional catharsis seems to have been reached. They cuddle one another tearfully, like survivors of a disaster. Peace is restored and life can proceed, but at a devastating cost. This is not how the mother had envisaged her parenting journey. She had set about the formidable task of raising a child with firm intentions not to repeat the patterns of the past. She would do things differently. She imagined her child would be sunny, cooperative and calm – inevitably, because she would be a kind, wise and calm parent; her child would behave admirably because she would do it right! The mother is, of course, myself, and this was the story of my family. Then I came across an approach to parenting which is not just a list of strategies to apply in particular situations, but a way of seeing. It places my relationship with my child at the centre of everything I do as a parent; in fact, often it’s all I need to do as a parent. This approach is called Connective Parenting. My relationship with my child differs from relationships with partners and friends because in adult relationships, each person is responsible for their own feelings and behaviour, and also for the relationship. In this case, I am responsible for my child’s well-being as well as my own, and totally responsible for the relationship. My son is just learning about relationship & it’s my job to teach and show him what it means and how it works, and to take care of the relationship between us. In all other ways – the investment of time and energy required, the inevitable points of friction, and the need for care and repair – it is a relationship like any other. Like any adult relationship, respect, trust and honesty are needed to make it work. If I ordered my adult partner about, dismissed his objections without listening, ignored his hurt feelings and rode roughshod over his desires and preferences, would he ‘cooperate’? Would the relationship survive? As in any other relationship, I need to listen to my son and respect his right to his opinion, even if it differs from mine. I have also learned to recognise my son’s right to his own feelings; they are his, not mine. I need neither to blame myself for them, nor to feel them too. Neither do I need to “fix” it, although I can certainly walk him through a process of looking at choices and finding solutions which will ultimately allow him, as he develops, to become emotionally skilled and responsible. I can simply allow him to have the experience of feeling sad, angry, scared or hurt – a normal part of living – and teach him to feel his own feelings, without the need to deny, repress or anaesthetise them away. In other words, by simply being with him through his experience, I support him to become an emotionally healthy human being. Likewise, I don’t blame my child for how I feel. My child does not ‘make’ me angry – it is my own assumptions, thoughts, beliefs, interpretations and expectations that drive my emotions, and I’m responsible for those. A good relationship can’t accommodate double standards; how many times have I shouted at my son, “Don’t you raise your voice to me!” I don’t ask my son to do anything I wouldn’t do myself, and that includes apologising and changing my mind when given good reasons. When I hear something come out of my son’s mouth that I don’t like, I ask myself: when was the last time I said that / sounded like that? Usually, the answer is: not long ago. So I’ve learned to take care that what I’m asking of my child, I’m also expecting of myself. I have learned that trust is a choice that we, as parents, can make on a continual basis. I trust that when my son gets upset he is having a problem, not being a problem. I trust that my best is good enough – and that my son’s best is good enough. I trust that he can be safe in the world, and even successful, without being perfect and that I can also be a good mum without being perfect. I trust that if he asks me to help him dress today, this is what he, a small child, just five years old, needs from his mother today, and that it’s ok to give it to him, because I trust he won’t need that when he’s twenty, or even ten. I trust that when he’s 35 and dining at Parliament House with Heads of State, he won’t slop dinner down his front, eat his snot, or drive toy cars around the table. I trust him to develop exactly as he needs to, and in his own time. I don’t need to correct every little thing, trying to shape him into perfect 35-year-old behaviour right now; I can let him be five. Too often we ask our children to respect us, without respecting them in return. What meaning can ‘respect’ have if it’s not mutual? I love Connective Parenting because it’s based on the belief that children are human beings, different but as real, whole and integral as adults. I believe that a child at the moment of birth is a whole person. Human babies are born with embryonic bodies and with minds which require long developmental pathways to unfold to adult complexity. However, the integrity of the person – their feelings, their desires, and above all their will – is as fully present at the moment of birth as it will ever be. I have learned to respect that my child’s thoughts, feelings and perceptions are as valid as my own. That does not mean they are the same as my own: my child’s brain is physically different to mine and so his mental and emotional processes quite different. But I respect that his thoughts, feelings and perceptions are as real and important to him as mine are to me. There is no one ‘true’ way of seeing things – just each person’s perspective, and my child has his own unique viewpoint. Valuing our relationship means caring and respecting how he sees things. Based on this foundation of respect, I make some different assumptions about my child’s behaviour than those I made before – that he was “naughty”, “oppositional”, “un-cooperative”, “obstructive”. Firstly I assume that what my child says or does – just like what I say or do – is usually with good reason, a reason which is real and important to him. Second, I assume – just as I would with an adult partner – that we won’t solve anything until everyone gets listened to and everyone’s needs (including emotional needs) are taken care of. I learned about ‘Agendas’. Bonnie Harris uses the word ‘agenda’ to describe what any one person wants in a situation. My agenda might be that I’m tired, want a cup of tea and need my son in bed before I can relax; that I want my son to eat a healthy balanced meal – now; or that in just an hour I need to get the shopping done and finish an article I need to write. My son’s agenda might be that he’s watching a TV show he really loves, and wants to watch another episode. Or the agenda could be more subtle: could it be he doesn’t want to change into his pyjamas, because he dreads the moment when he is separated from Mum and left in the dark? My child’s agenda can be very inconvenient for me, but once I respect my child’s agenda, I usually find I can relate to it. If he’s frustrated, tired, hungry, grumpy, intent on finishing a task he’s engaged in, or simply wants what he wants – well, which of those can’t I identify with? And if someone – say, my partner – approached me at such a moment, instructing, demanding or criticising, yelling or threatening me with ‘consequences’ if I did not immediately (for example) turn off my computer, put my shoes away, or come for dinner, would I not become irritable, defiant, or even just plain mad? So why would I expect any different from my child? And if I handle him the way I would like to be handled in similar circumstances, it usually works best. 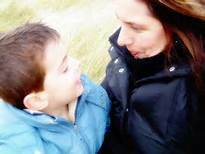 Recognising my son’s agenda means I no longer see him as an extension of myself: if he’s angry, I’m angry. If he’s misbehaving, I’ve failed. I now see my son as a separate person with his own feelings, motivations, responses, desires, needs, world view and experience; different to, but as valid as my own. This doesn’t mean my child gets everything he wants. It doesn’t mean that we don’t hold very different roles in the family. As the parent, I am responsible for making decisions that look after my child, myself, our household, and get done the things that need to be done. But respecting my child’s agenda means that I do this with accommodation of my child’s preferences, viewpoint, wishes and feelings as much as possible; and guess what – it works a whole lot better. I’ve learned about the ‘Gap’: the difference between what a parent thinks they’re saying, and what a child (or teenager!) thinks they’re hearing. Perfectionism, inherited from my family, taught me to always pay close attention to what wasn’t good enough. What was missing, what fell short, what didn’t measure up. This blinkered vision left little space to notice what was good and fine, either in myself or my child. This means that even when I think I’m saying something completely different, across the Gap my son often receives the message: “You’re not good enough.” This hit me in a heartbreaking way when my son said one day, “Mum, do you think I’m hopeless?” “No – of course not. What’s got you thinking about that?” “When you tell me off all the time, it makes me feel like I’m hopeless,” he replied. I can’t actually stop this, but being aware of it means that I am able to compensate for it. Sometimes I can stop myself saying it, or say it differently. Sometimes I say it again in a different way, as soon as I hear myself say it. Sometimes I find a way to explain what I really meant, and tell my child explicitly that he is good enough and that I don’t expect him to be perfect. I’ve learned about the ‘Pause’. These days, when my son begins to react, when he answers me back, says ‘I won’t’ or raises his hand to throw a toy, the first thing I do is pause. In that split second, I stop – look – and listen. I notice the sounds my son is making, the expression on his face, the movements of his body, and the objects (or people) around him. From this I learn so much about what is happening for him at that moment. I think about what’s happened in the preceding moments – and hours, and days, and why he might be feeling this way. Mentally, I quickly scan each of our ‘agendas’. Is my son tired? hungry? maybe getting sick? Is he absorbed in a game so fun that understandably, he is unwilling to leave it to go shopping? How would I feel, in his shoes? It matters, because it tells me what I need to do to make the situation work for us both. And am I tired – hungry – sick – grumpy – stressed – needing to get somewhere by a certain time – concerned about the care this child needs and my responsibilities as a ‘good parent’? – all of this matters too, because I’ve let go of the limiting belief that my own feelings and needs don’t count. When my son asks me if he can have or do something, I now Pause before I answer; sometimes for five seconds, or even ten, or say that “I need to think about it”. I think about what he needs and what I need. Is what he’s asking reasonable? Safe? Am I myself able to balance it with my own agenda, without getting so stressed that it will impact on him later? Connective Parenting has taught me to think carefully about my answer, and then say “Yes” as often as possible. I’ve learned about the step-backward and the about-face. I think that often we are so afraid of losing control of our children or allowing them to get the ‘upper hand’ that sometimes we stick to our guns even when it’s unhelpful or even causes problems. I want to teach my child to be a person able to be flexible, capable of listening to other points of view and adjusting his own. I don’t think there’s anything wrong with changing my decision about something, especially if I explain the reasons. My son is full of fun, mischief and natural high spirits and once I became able to separate his agenda from mine, I realised this is one of the most adorable things about him. I also realised that my parenting – because I was tired, worried, and needed him to be a ‘good’ child so I could feel like a ‘good’ mother – had me acting like a repressive regime crashing down upon the natural exuberance of a population. And I’ve learned about repair. A plane, when flying on autopilot – that is to say, most of the time – does not fly in an undeviating line but tacks back and forth across the route to its destination, constantly making corrections to keep its overall flight on track. I’ll never be perfect. I’ll do things as a parent that I wish I didn’t. I’ll sometimes be tired or irritable or even occasionally just plain mean. When I hear my parent’s voice come out of my mouth, when I slip into ‘command and demand’ parenting rather than connecting with my child, or, worse still, into fault-finding parenting, I no longer waste energy scolding myself. I simply notice and change track. I don’t have to continue in the same vein. I can change my tone of voice and use different words than I did a moment before. I can talk about what happened and I can repair. I heard parenting specialist John Hartmann say ‘30% of communication is successful; all the rest is repair’. Thus a diversion down an old pathway is not a failure, it’s a chance to model one of the most important skills I will ever teach my child. Connective Parenting has allowed my son and I to cease being adversaries and become a team of two, secure in the knowledge that our tiny team can withstand adversity, challenges and the human fallibility of each of us. Shifting away from “fighting” or “combating” his behaviour has released me from seeing my son as a ‘problem’ – that he is intentionally annoying and uncooperative, that he is disrespectful and deliberately obstructive – behaviour that I always felt I needed to brace myself against – and allowed me to reshape my image of him as a sweet, sunny, cooperative, joyful, playful, helpful little boy. I’ve changed my spectacles. It’s so important, because children know who we think they are, and oblige by delivering just the kind of behaviour we expect from them. This approach to parenting has given me back my confidence. It is certainly not a panacea that will eliminate every family problem – nothing can do that – but it allows me to feel confident about what I’m doing with my son, and why. That gives me the freedom to not care what other people think. My son still has ‘difficulties’ sometimes, and still sometimes has me tearing my hair out. We no longer get into conflict several times a day, every day, like we did before. Standoffs are occasional and when they occur, I can most often stay calm, and can forgive myself when I don’t. The rest of the time, we work together well. We discuss, we negotiate, we make cooperative decisions based on trust, respect and honesty. I know now that his difficulties are his, not mine. That awareness frees me from responding with guilt, anxiety and panic, so I can stay calm and help him find a way through his distress. How much safer that must feel for him; perhaps that’s why his distress spirals out of control far less often now than before. My relationship with my son is strong and real, it’s robust and resilient and it’s improving every day. Within that relationship lies the foundation for his self-image, self-esteem, and all his future relationships. That relationship is the platform on which he and I, a team of two, will meet life’s challenges through teenagerhood and far beyond. Connective Parenting was developed by Bonnie Harris www.connectiveparenting.com. Bonnie’s books ‘Confident Parents, Remarkable Kids’ and ‘When Your Kids Push Your Buttons And What to Do About It’ are available in good bookstores and online. Thanks Julietta for sharing your wonderful insights in to parenting. I will take them with me in to my work as an Inclusion Support Facilitator where I am supporting educators to partner with the children they find challenging, within a culture of mutual respect. Fluid, graceful writing and cogent expression of complicated topics. This is a wealth of insight! Thank you, Julietta and Bonnie. So blessed by this article.. Thank you so much.